Brook Trout on the Decline: What Can We Do? Home » News » Brook Trout on the Decline: What Can We Do? Brook Trout are the only remaining native Salmonid fish species naturally occurring in Toronto and region tributaries. Monitoring data from TRCA’s long-term Regional Watershed Monitoring Program show that the occurrence of Brook Trout in Toronto and region has decreased over the last sixteen years (2001-2017). This change in Brook Trout catch frequency across the TRCA watersheds is supported by similar data findings across both southern and northern Ontario. Regionally, Brook Trout are found in the Duffins Creek, Humber River and Rouge River watersheds, predominantly where these watersheds overlap with the Oak Ridges Moraine or Greenbelt lands. A a sensitive coldwater fish species, Brook Trout rely on good water quality habitats with plenty of groundwater upwellings to support their spawning, feeding and overall habitat needs. Brook Trout are known to prefer coldwater streams (less than 24 degrees Celsius) that have a year-round supply of clear, well-oxygenated waters protected by overhanging branches, logs and rocks (Freshwater Fishes of Canada, 1988). For these reasons, Brook Trout are often used as indicators of coldwater habitat and good water quality conditions. Climate change, invasive or stocked species, habitat fragmentation, and land use changes all pose threats to Brook Trout habitat. For example, increases in impervious surfaces such as paved roads in urbanizing areas means there is less opportunity for groundwater recharge, which results in reduced baseflows and warmer stream temperatures. 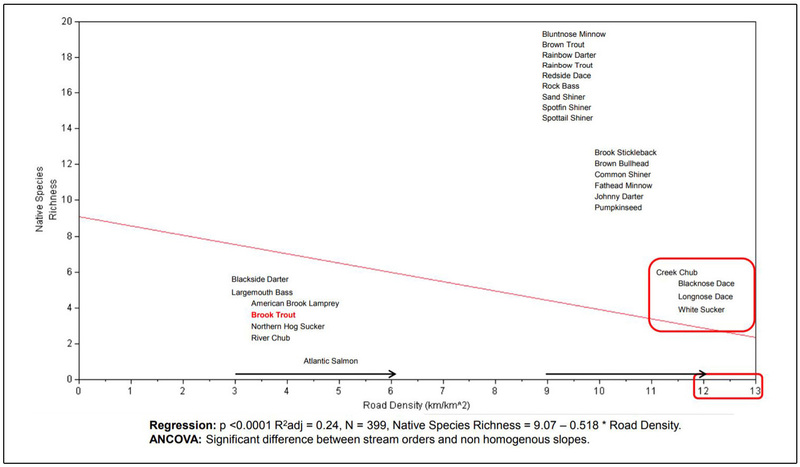 The Regional Watershed Monitoring Program data from 2001-2012 shows that Brook Trout are not found in regional streams where surrounding road density thresholds are above 6 km/km2, and that only four fish species typically persist when road densities are higher than 11 km/km2. The assumption here is that the higher the density of roads in a given catchment, the greater the level of urbanization. Read more about urbanization and fish communities. What is TRCA Doing to Help? At the November 2017 Latornell Conservation Symposium, TRCA’s Environmental Monitoring staff highlighted how different departments in TRCA work together to help prevent or minimize the threats facing Brook Trout and their regional habitat. The presentation underscored the important regulatory and guidance role that TRCA plays in helping to prevent and/or mitigate the threats to Brook Trout habitat. The presentation also highlighted TRCA’s ecosystem approach in restoring and/or creating habitat that benefit many species, including sensitive species like Brook Trout and the federally endangered redside dace. Through its monitoring activities, TRCA also gauges ecosystem health, identifies areas of concern, and evaluates the success of conservation management efforts. The reality, however, is that the threats to Brook Trout extend beyond the physical boundaries of Toronto and the surrounding region. For that reason, TRCA works actively with its municipal partners and other government agencies to foster sustainable development. Such a collaborative, multi-agency approach can help to ensure that Brook Trout will continue to thrive in our regional streams for generations to come. Through scientific data collection, TRCA’s Environmental Monitoring and Data Management team tell the stories about the changes affecting the natural areas and watercourses within our regions. For more information, please visit our webpage, follow us on Twitter, subscribe to our Monitoring Matters e-newsletter, or visit our YouTube playlist.